Blog » Should you buy a Groupon TEFL course? 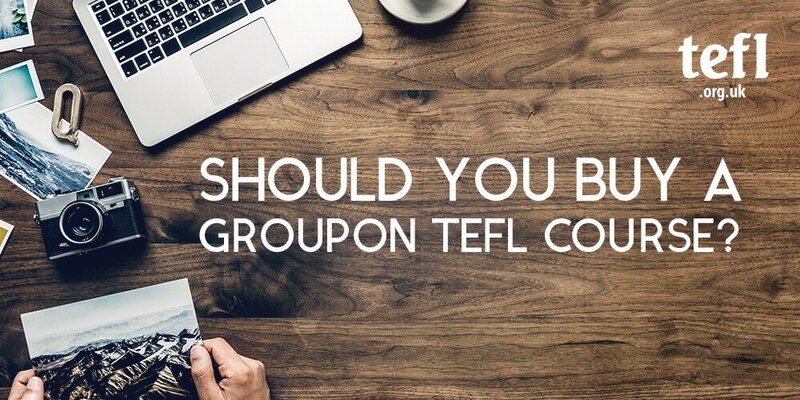 Should you buy a Groupon TEFL course? We’re guessing that if you’re looking to get TEFL qualified it’s because you want to find a job teaching English, so you’re going to want to make sure that the course you take will give you the best chance of finding a great teaching position. Occasionally, we’re asked by someone why they should pay for one of our courses when they can buy a Groupon TEFL course for as little as £20 to £50. Of course, we’re inclined to recommend you get TEFL qualified with us as we strongly believe in the quality and value of our courses (as do thousands of our graduates! ), but it really is essential for you to know how to choose a course that’s going to properly prepare you for teaching English and get you a job. Why do we think it’s important to talk about this? Recently we’ve been contacted by employers who have informed us that they don’t accept these budget TEFL qualifications, as well as individuals who have purchased these courses and have become concerned about their job prospects and the quality of these courses. We want to help you make an informed decision so we’ve put together some information we hope you’ll find helpful. What does it mean for a TEFL provider to be accredited? Simply put, it means that a provider has undergone external monitoring to ensure the courses they offer meet a certain standard of quality set by the accrediting body. This is extremely important because anyone at all can create and market a course, but if it hasn’t been monitored by a credible external body then there is simply no guarantee of quality. But what accreditation should a TEFL provider have? There isn’t a single accrediting body for TEFL courses, which means you’ll find that most reputable providers are accredited by recognised and established bodies that are not focused solely on TEFL. Not all accrediting bodies are equal and the easiest way to spot a quality TEFL provider is if they’re accredited by government and/or government-affiliated bodies. Membership of an organisation or register is not accreditation – remember, accreditation entails external monitoring, not just the payment of an annual membership fee. If you can’t find information about a provider’s accreditation on their website or if they’re only accredited by one body that seems to specialise in accrediting budget courses then we recommend proceeding with caution. We’re the most accredited provider of TEFL courses in the UK and you can easily find further information about that here. Why are Groupon TEFL courses so cheap? Our courses are competitively priced, and the cost reflects what’s offered. As with anything, you get what you pay for! Groupon TEFL courses keep costs so low because they don’t have the same level of quality-control or tutor, technical, and administrative support. They also usually include hidden costs, such as a charging for a hard copy of your certificate, which can sometimes actually be more than what you paid for the actual course! If a provider mentions that fees apply for certain services – such as certificates, extensions, faster marking – but doesn’t specify the price always make sure to query this before signing up because these fees can really add up. You could end up spending significantly more than the initial cost of the course. Did you know that Groupon takes a 50% cut from deals advertised on their site? That means if you buy one of these budget TEFL courses for £20 the company is only getting £10! These hidden charges are where these companies make their profits. Our courses are designed and led by highly qualified and experienced EFL teachers and you’ll have the same tutor with you for the duration of your online course. They will mark your work within 48 hours, provide feedback, and you can contact them with any questions you have throughout the course. There are also no hidden fees – you’ll receive a hard copy of your certificate at no extra cost regardless of where in the world you’re based, and everything you need to complete the course is included. Will the course be recognised by employers? Not always – some employers may accept the qualification, but we are aware of those that won’t. We’ve previously written about TEFL scams and bad employers and we know that bad employers don’t care much about your qualifications so will often accept anything. Accreditation isn’t just important for you but it also gives reputable employers assurance that the teacher has undertaken training of a certain quality – if they see that the company you’ve gained your qualification with isn’t adequately accredited then they may not recognise it. Put yourself in an employers shoes – if you have a Groupon TEFL qualification and are up against other candidates who have a qualification with a highly accredited and internationally recognised TEFL provider then who’s going to stand out? If you’re looking to find a job with a good employer then it really is worthwhile to invest in a TEFL qualification from an established provider that has a good reputation worldwide. It might not seem like much to potentially waste £20 on a Groupon TEFL course, but with hidden fees that that can start adding up up you could actually find yourself a lot more out of pocket. Do your research and make sure the course you choose is going to prepare you to teach English, provide you with support both during and after the course, and give you the best chance of finding work! You can always get in touch with us if you have any questions and you can even ask current students and graduates by joining our Facebook group.